Medium Traveler Tea Set is a suitable tool to be brought with you when you are traveling. Compact and unique tea set made from bamboo. 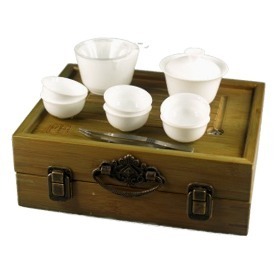 Traveler Tea Set comes with 6 small tea cups (Width = 4.3 cm, Height = 2.5 cm), gaiwan (Width = 7 cm, Height = 5 cm), and tea tray(24 cm x 19 cm) for brewing tea. Theres also a metal pincer, water tube, tea strainer, tea pitcher and tea cloth in this set. The tea tray can work as a carrying bamboo carrying case as well. Everything then comes in a nylon bag to protect the bamboo case.